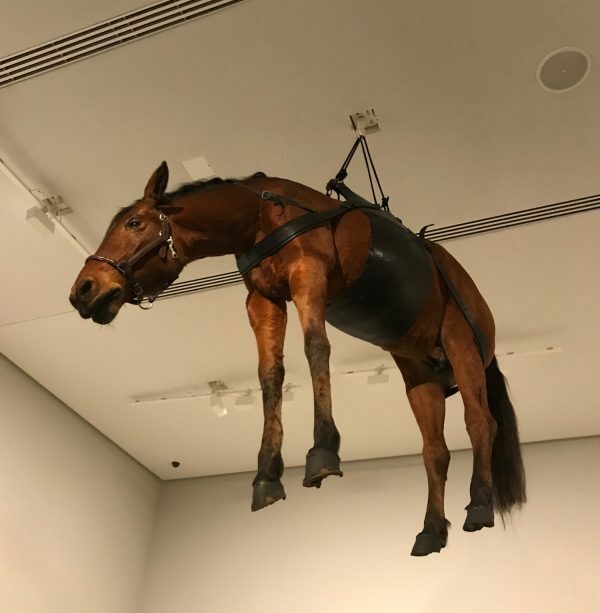 You are currently browsing the archives for Art. 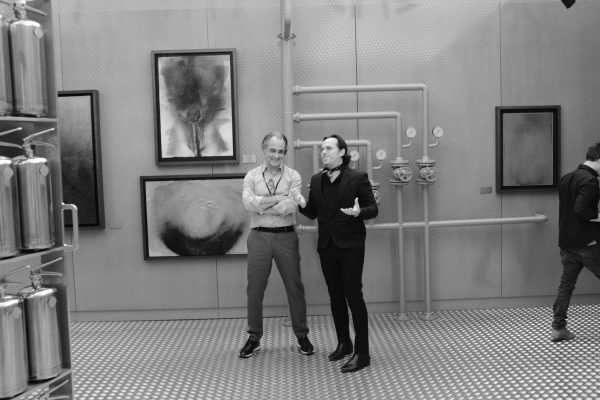 Swiss luxury watchmaker HUBLOT and MARC FERRERO, the artist behind Storytelling Art, unveiled the Big Bang One Click Marc Ferrero, which could be viewed at the Baselworld trade fair this week. Paying homage to the 21st century woman, who distinguishes herself through the multiplicity of her roles, in this exclusive timepiece she is embodied as the heroine of modern times. This collaboration marks an exploratory approach to art and watchmaking. The 21st century woman is a real muse. In turn wife, mother, friend, lover, business woman, femme fatale, fashion icon or night owl, for every hour of the day the modern woman sets herself apart as unpredictable, multifaceted and unique. 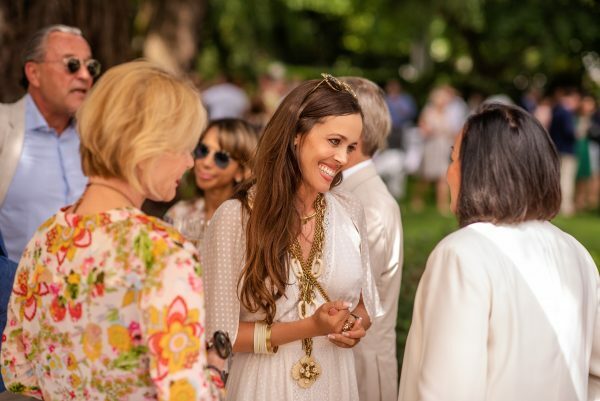 She is disarming and makes light of the simple or complex adventures that she comes up against; drawing upon her charm, she juggles the lives that fill each of her days. The dial tells the story of this heroine of modern times with ‘Lipstick’, an iconic work by the artist. Enigmatic behind her dark glasses, she remains majestic in the face of the unexpected and affirms her femininity, armed with her lipstick. Spinels in shades of red, topazes for the turquoise version, and forty-two fine stones decorate the bezel of the new 39-mm case, which is adjusted to her feminine wrists. With one touch of its “One Click” patented fastening system, the leather strap makes way for a version in alligator and rubber, a touch of sophistication appropriate for the moment. 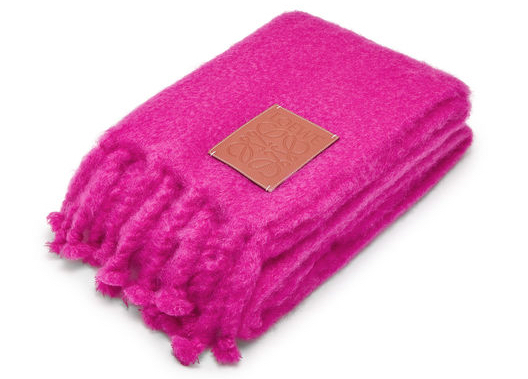 Available in red and turquoise, the special series will be available in 50 copies of each tone. HUBLOT and MARC FERRERO cultivate the art of exploration in their respective fields, with fusion as the guiding principle. 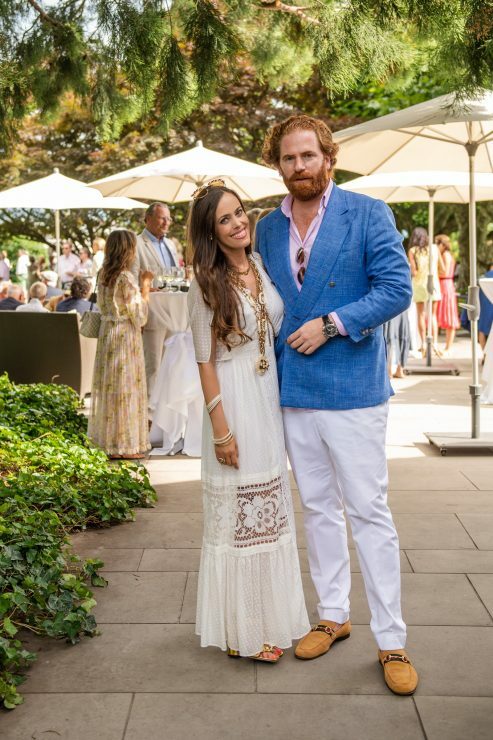 Personally speaking, I love these two models. 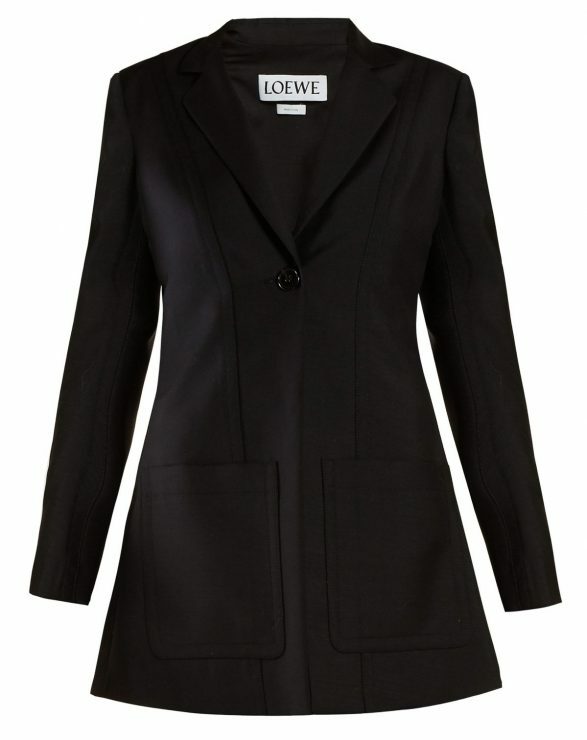 They are sophisticated and cool and honor us women of today that manage to master everyday life with all its facets. Welcome to the ​Empathy Suite, a Sky Villa designed by and featuring the works of world-renowned artist Damien Hirst. The artist has collaborated with Bentel & Bentel Architects to design the world’s most expensive hotel room. If you are looking for some for Instagram-worthy moment and you have a spare $100.000 per night, it’s your place to stay at the Palms Casino Resort in Las Vegas. 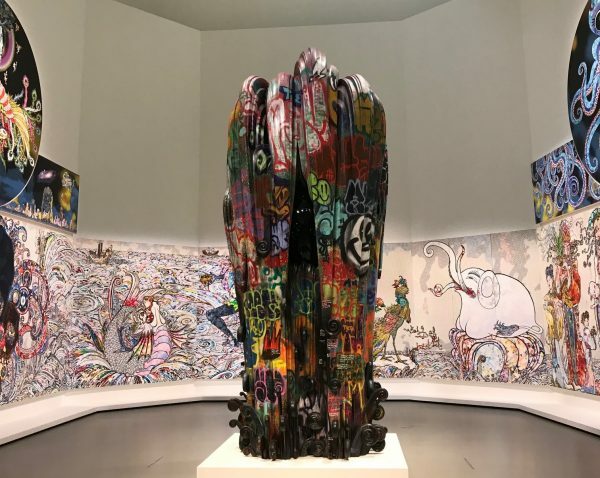 Sin City has a reputation for excess, and the nearly $690 million renovation of the hotel has also filled it with a huge amount of impressive artwork, including works by Takashi Murakami, KAWS, Andy Warhol, Jean-Michel Basquiat, and, of course, Hirst. Once you pass through the gilded doors, you’re met with a 13-foot-long tiger shark that has been trisected into three tanks of formaldehyde, lofted above bottles of top-shelf spirits – Hirst’s first bar project in the United States, featuring the fierce sculpture titled The Unknown (Explored, Explained, Exploded). The 836-square-meters two-story sky villa sits on top of the Palms and is the first and only of «its kind featuring a collection of contemporary art at this scale.» It’s an eclectic mix of blue-chip and street art that rarely mingles under one roof. With many original pieces from some of Hirst’s most notable series, a custom butterfly-motif mosaic tiled cantilevered pool overlooking the Las Vegas Strip and Venus gray marble featured throughout the villa, it will surely attract lots of celebrities – especially after the announcement that they’ll be holding a three-night festival for the anticipated opening of the KAOS nightclub, featuring the likes of Cardi B, Skrillex, and Travis Scott, with additional performances by Alicia Keys and Hozier at their Pearl Theater. 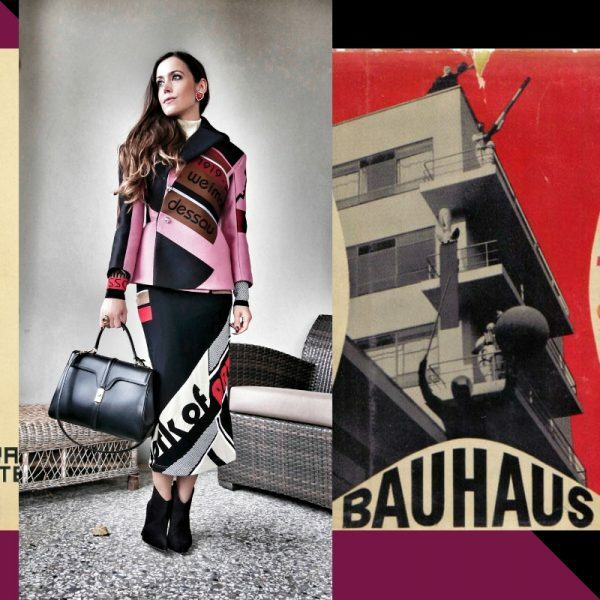 From spiral staircases to curving chairs, the creative yet practical designs of Bauhaus are one of a kind. 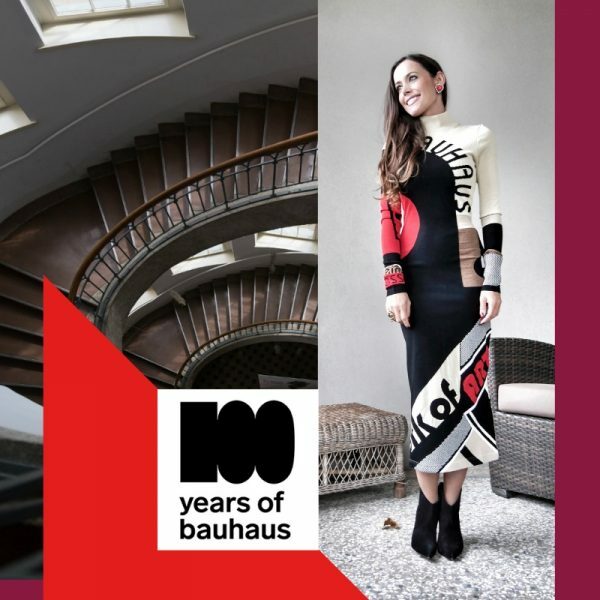 This year, the Bauhaus celebrates 100 years since its founding in Germany by Berlin architect Walter Gropius in Weimar in 1919. 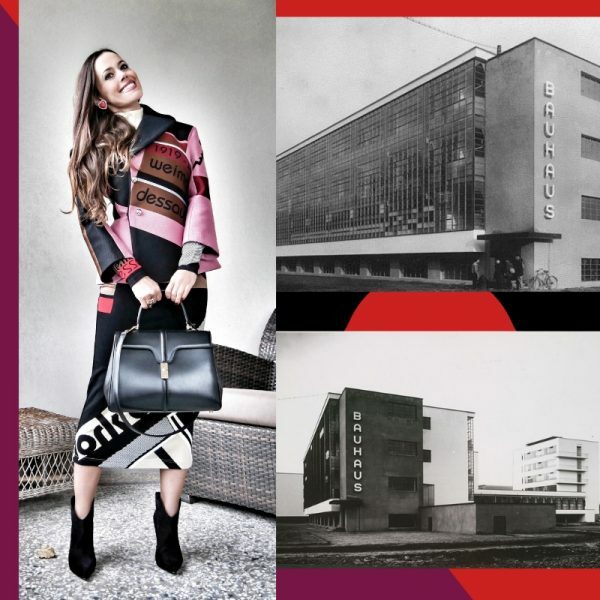 Until today, the Bauhaus Art School continues to shape art, architecture and design all over the world. 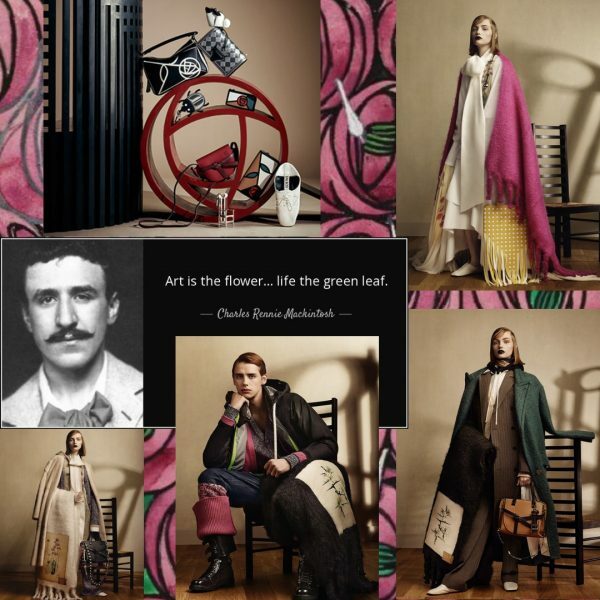 My beloved Mary Katrantzou dedicated her F/W 2018 collection to this fantastic movement – a testimony how art, culture, architecture and fashion are all linked together. 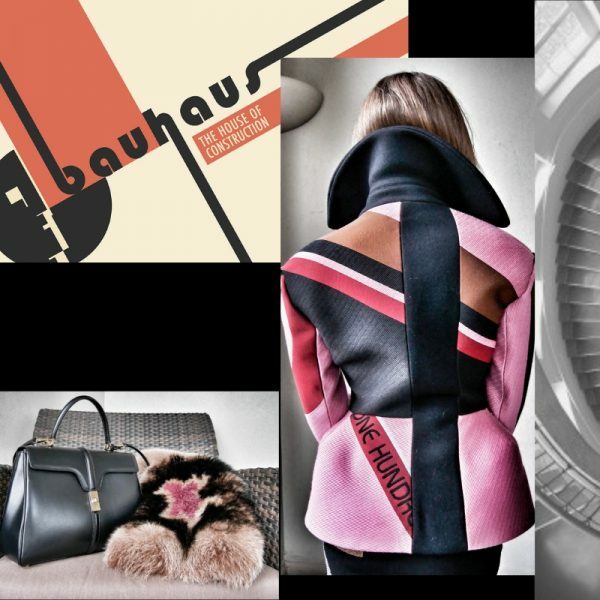 My look: Lazlo jacket and Alta intarsia stretch-knit turtleneck midi dress, both by Mary Katrantzou, Paris suede ankle boots by Saint Laurent, «16» bag by Celine, and caramel and raspberry handmade Shibori dip-dyed fur stole by Miu Miu. and vintage CC heart motif earrings by Chanel. 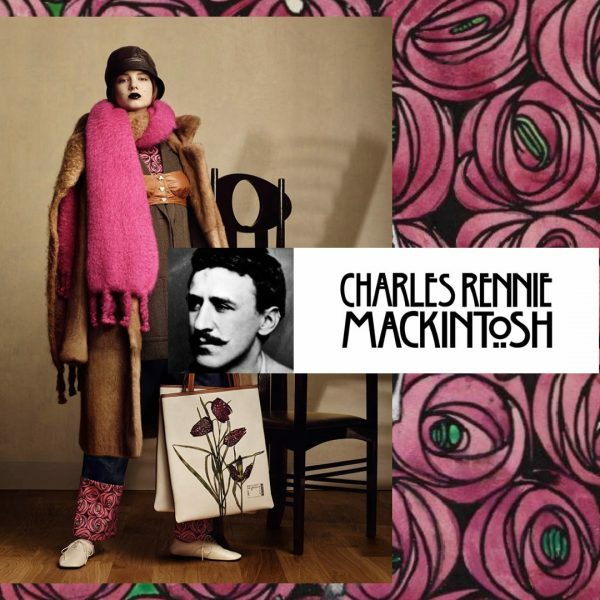 This holiday season, LOEWE is launching a special capsule collection inspired by the work of renowned Scottish architect and designer Charles Rennie Mackintosh (1868-1928). 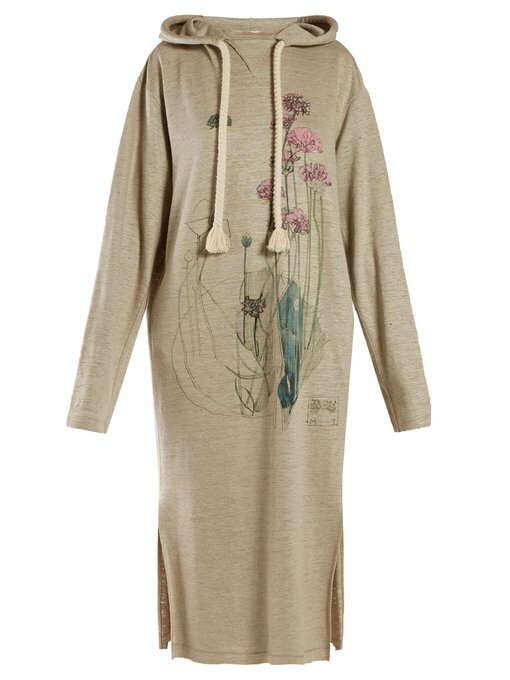 Regarded as one of the originators of modernism, his seismic influence on the 20th century arts & crafts movement is still being felt to this day. 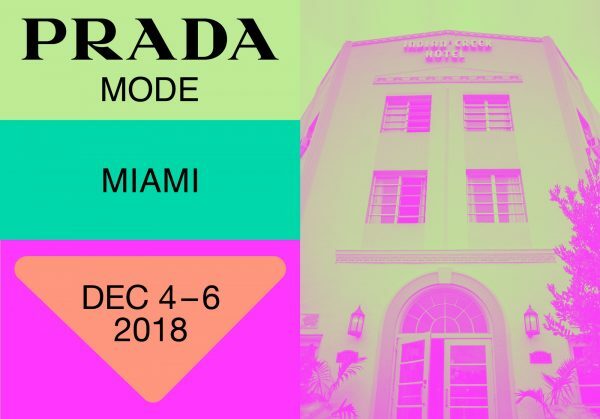 With a full accessories line and ready-to-wear for men and women, the holiday collection celebrates the vast scope of the designer’s work, from his architecture through to his furniture design. 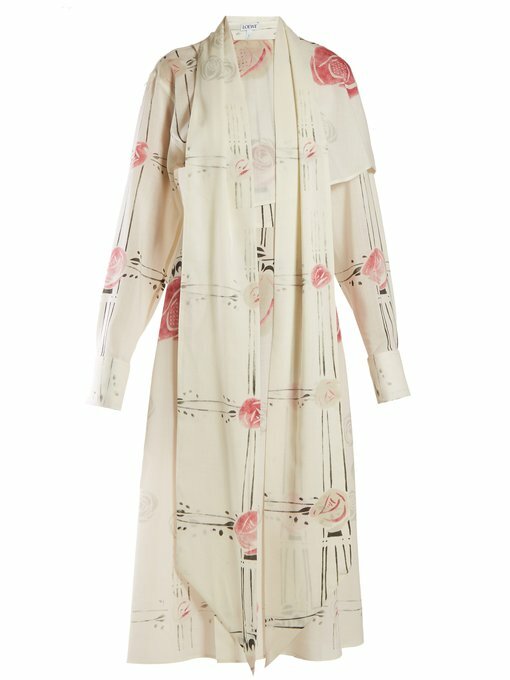 Playing with the various facets of the Mackintosh universe, LOEWE honours his distinctive aesthetic by incorporating his signature grid patterns, stained glass windows and botanical watercolours across the range. 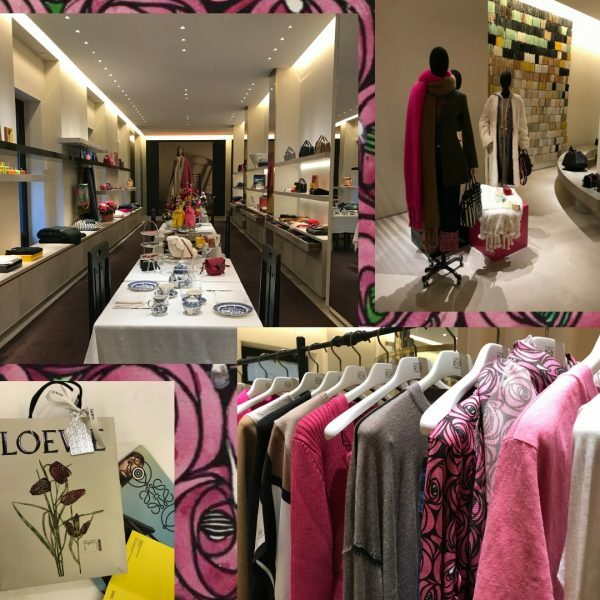 When I was in Madrid mid November, I was happy to explore the collection in the brand’s flagship store in the Salamanca district before it is now hitting the shelves worldwide. 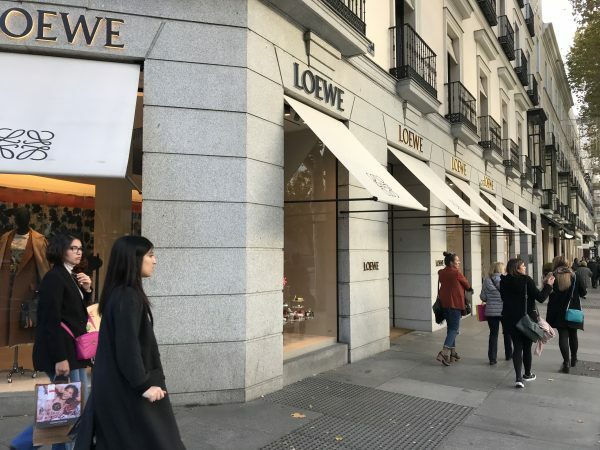 The CASA LOEWE is all about interior design and customer experience thanks to LOEWE‘s creative director Jonathan Anderson. 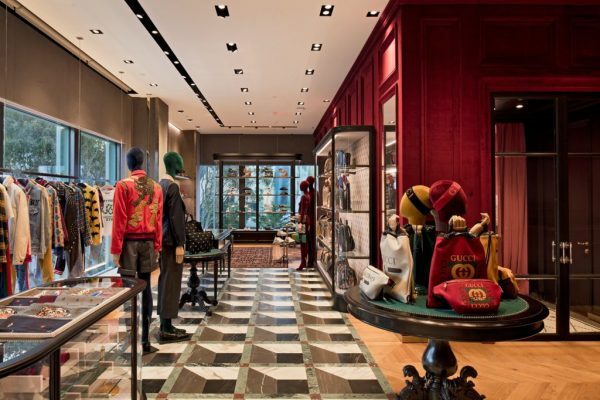 The lifestyle store spans three floors (totaling over 10,760 square feet) of a landmarked 19th-century building. 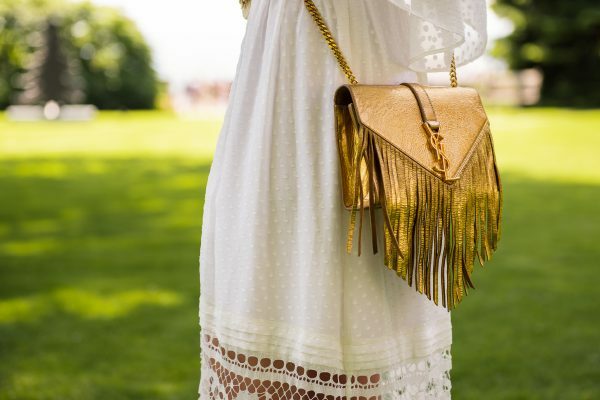 Stay tuned for an outfit post with my favorite pieces from this collection! 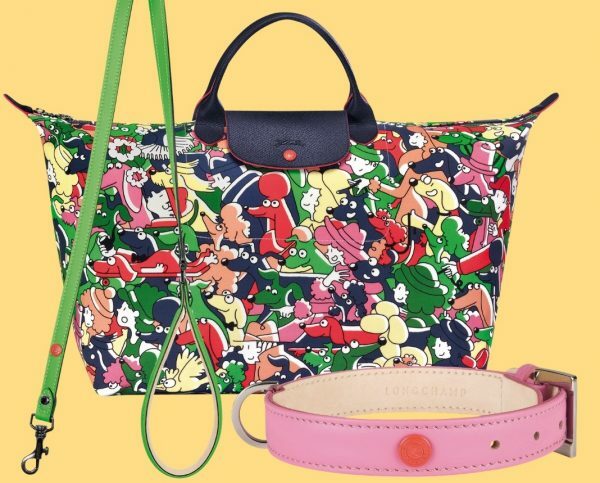 For its F/W 2018 collection, Longchamp has teamed up with the French designer Clo’e Floirat to create a pop and colorful collection, featuring dogs on many pieces. The artist brings her stylish touch to a selection of bags, including the iconic «Le Pliage», small leather goods and accessories. Clo’e Floirat also created an exclusive dogs line with colorful cowhide leather leashes and collars in three sizes and five colors. Playing with humour on a theme of this «must-have» accessory, Clo’e Floirat has imagined a story of «Le Pliage» bag unfolding in three formats. 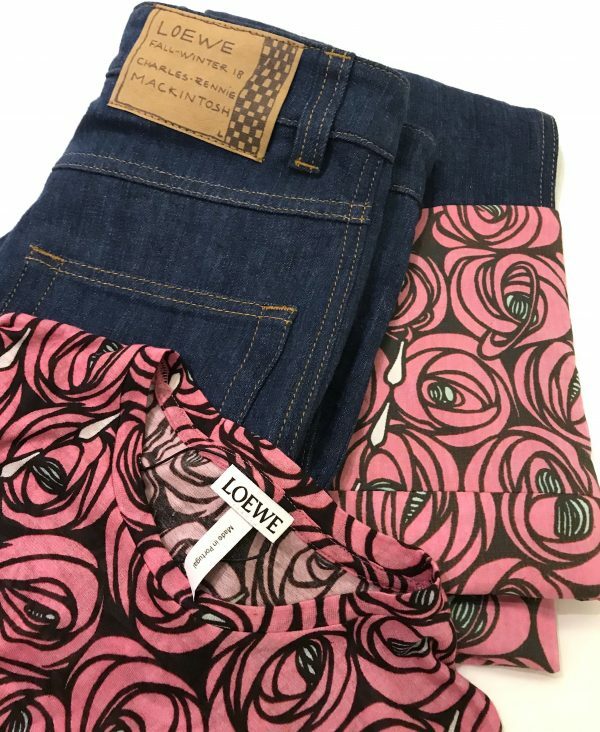 She portrays packs of dogs in bright and bold colors walking their owners on the nylon canvas’ tone-on-tone navy print flap with red signature details. 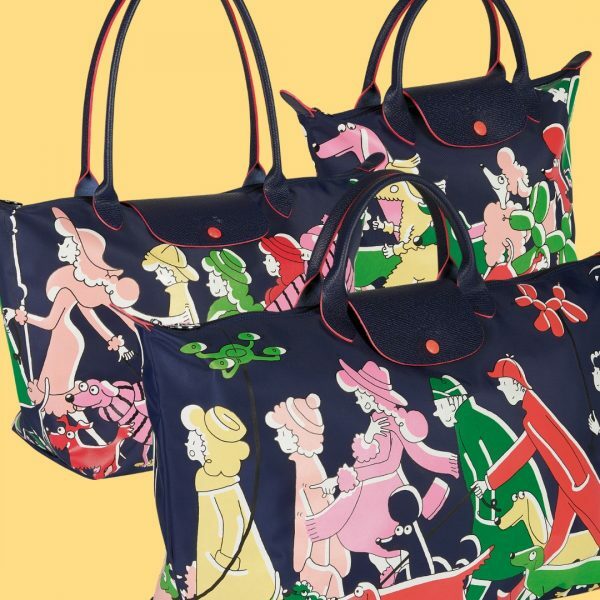 The whimsical dog pattern can be found throughout the vibrant cotton canvas travel bag’s limited edition and on a large silk scarf. 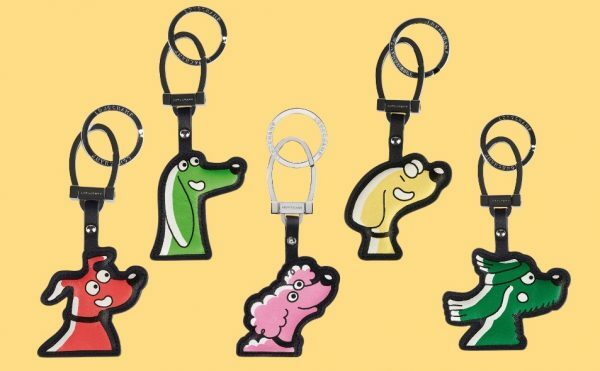 The hounds are equally featured with their noses held high on 6 key rings. 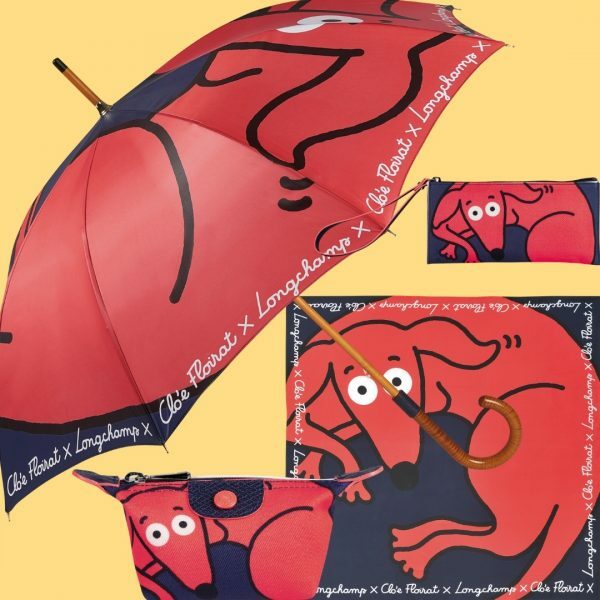 Finally, the star of this collection – a red dachshund – appears on two small leather goods, a small silk scarf and an umbrella and shown prancing all over packaging and paper bags, never-to-be-forgotten. 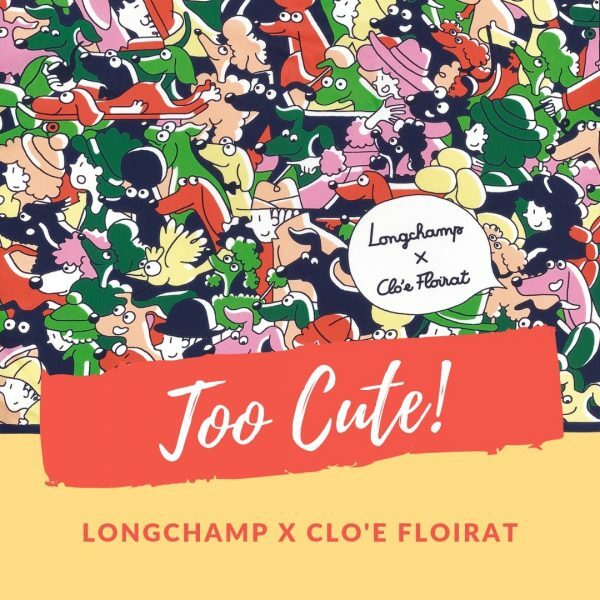 With Clo’e Floirat, Longchamp once again offers center stage to artists while revisiting its classics, combining modern day contemporary designs full of cheerful playfulness! 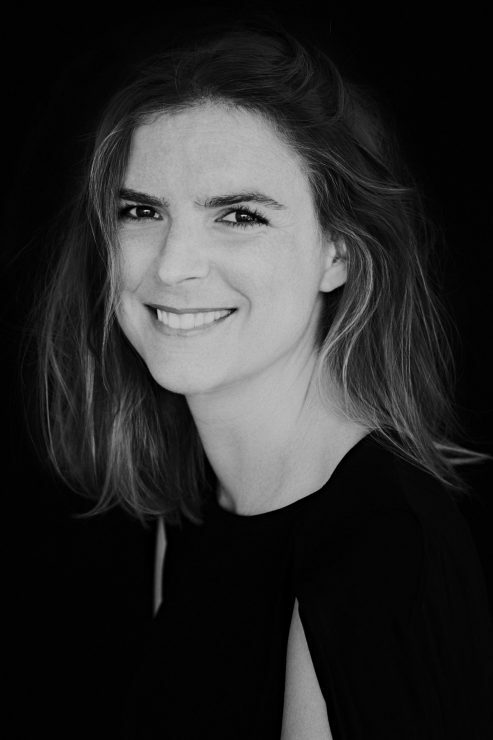 Clo’e Floirat is an art critic and cartoonist working between New York, London and Paris. 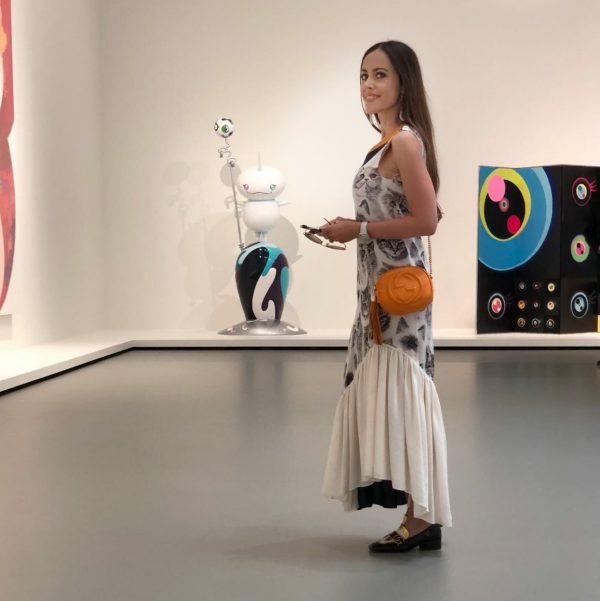 She explores via «drawing Crit’ writing» the boundaries between writing and drawing for various publications such as the New Yorker, and collaborates equally with Robert Wilson and Rufus Wainwright. 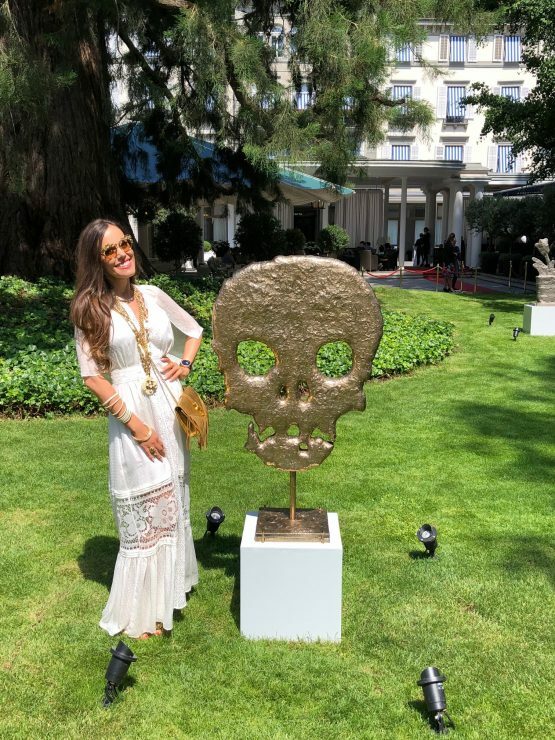 Author of Pas Mal pour de l’art (Not bad for art) (Marabout edition – 2016) and Je vois quelqu’un (I am seeing someone) (Marabulles collection – 2018), Clo’e Floirat is interested in perspectives towards art as well as the relationship between psychologists and their patients…Always with a signature humor that cleverly contrasts ego and intention. 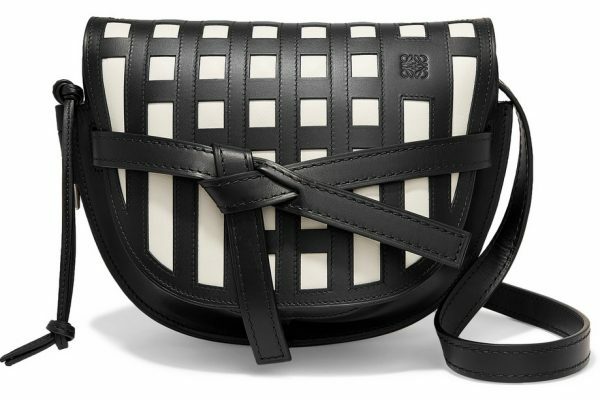 The Longchamp x Clo’e Floirat hits the shelves this month! 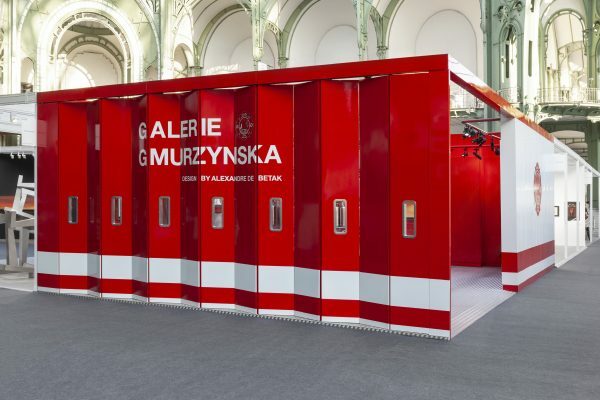 Having presented a Karl Lagerfeld designed booth in 2011 at FIAC, Galerie Gmurzynska – the leading international art gallery specializing in masterpieces of both classic modern and post-war art – is returning to the fair with a visionary installation by French designer, scenographer and creative director Alexandre de Betak, who is mostly known for his involvement in the production of Victoria’s Secret shows, which he has producing and choreographing for many years. 2003 marked de Betak’s debut in design, when he created an acrylic glass bookshelf and a leather bench with French design house Domeau & Perez. 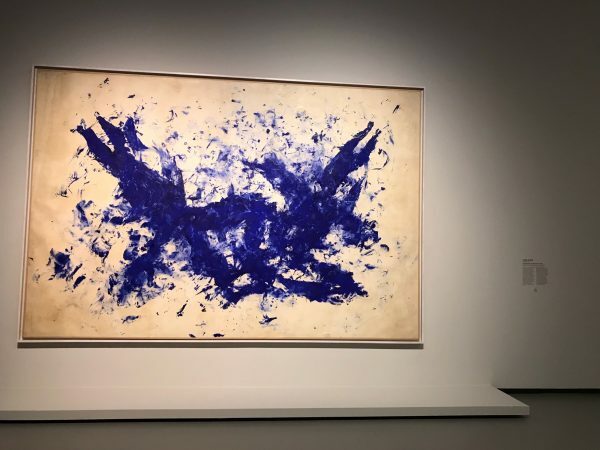 Moreover, he is known for various collaborations with important museums, among others the MOCA in Los Angeles and the Musée des Arts Décoratifs in Paris. Since its discovery, fire has been the propelling force of innovation, civilization and ultimately cultural advancement. Artists throughout the history of art have been drawn to its ethereal power to destroy, create, cleanse and illuminate. 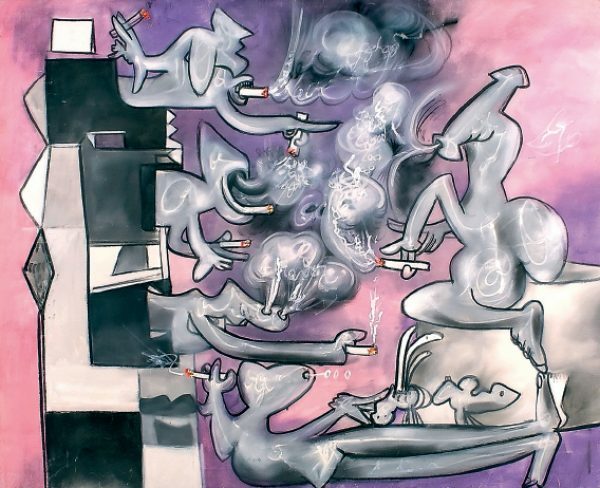 The survey exhibition «On Fire» will include a diverse list of artists using or depicting fire in all forms throughout the 20th Century, from Joan Miró to Otto Piene, Yves Klein, Alberto Burri, Roberto Matta up to Tom Wesselmann and others. A booklet with an introduction by Germano Celant will be accompanying the exhibition. 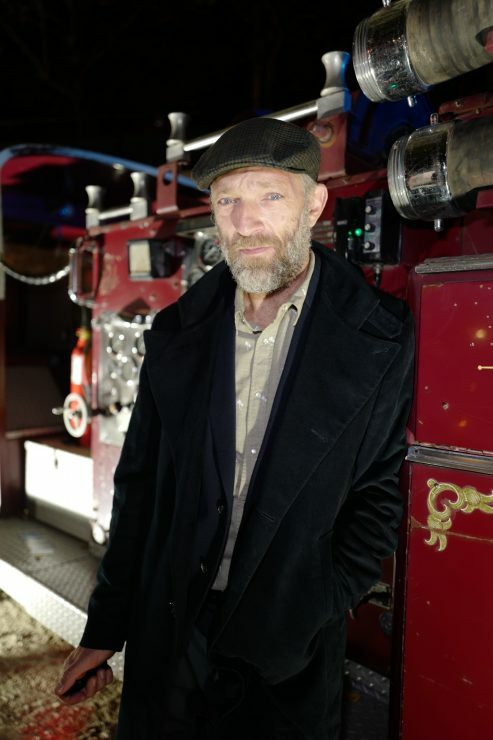 On Wednesday evening, the opening party of the gallery took place next to the Seine with a huge fire installation by Alexandre de Betak. 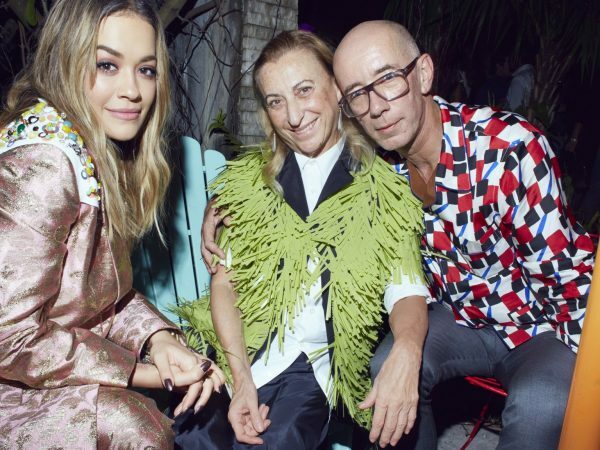 The gallery owners Isabelle Bscher, Krystyna Gmurzynska and Mathias Rastorfer and star designer Alexandre de Betak welcomed actor Vincent Cassel, not only since his role as Vincent van Gogh in «Loving Vincent», an art fanatic, Parisian model and author Caroline de Maigret, star photographer Ellen von Unwerth, hotel guru André Balazs and actor and artist André Saraiva, the u.a. 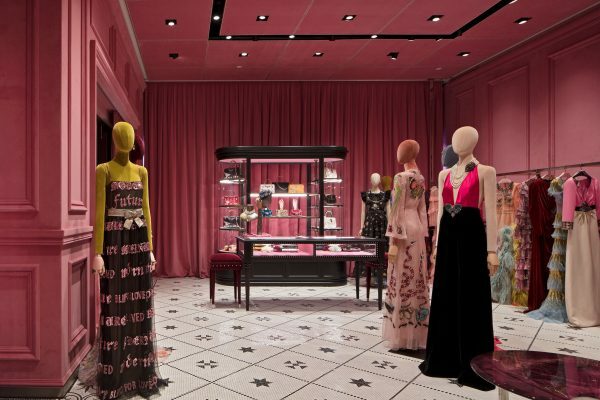 also designed for Louis Vuitton, Chanel, Tiffany and Converse, the Italian concept artist and filmmaker («Multimedia Popartist»), Francesco Vezzoli and Michel Gaubert, the best sound designer in the fashion world with clients such as Gucci, Fendi, Jil Sander, Roberto Cavalli, Bottega Veneta, Balenciaga, and Chanel. 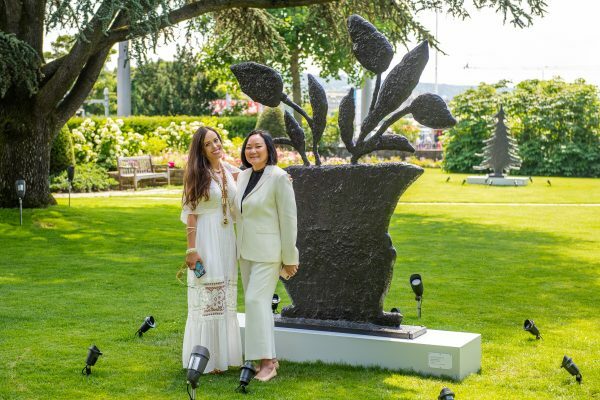 Last Sunday, I attended the private viewing of the 16th edition of ART IN THE PARK in Zurich, followed by an extremely delicious lunch created by Michelin Star chef Laurent Eperon. 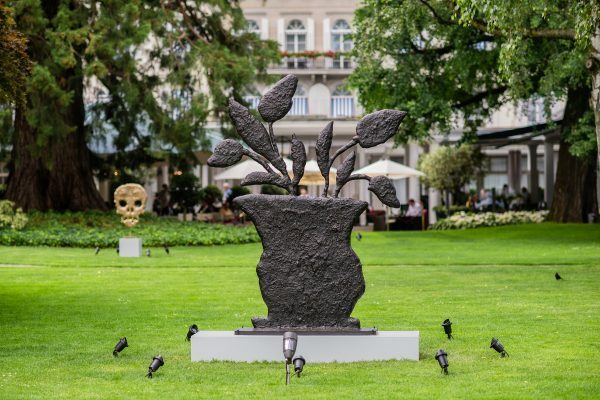 It is truly impressive what GIGI KRACHT has achieved over the past years, bringing the most prestigious artists to the garden of the iconic Baur au Lac hotel. 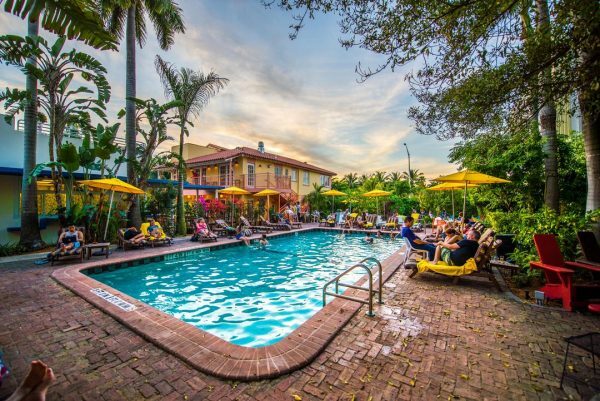 Every time, I am there, I am amazed by the beauty of this oasis in the middle of the city. 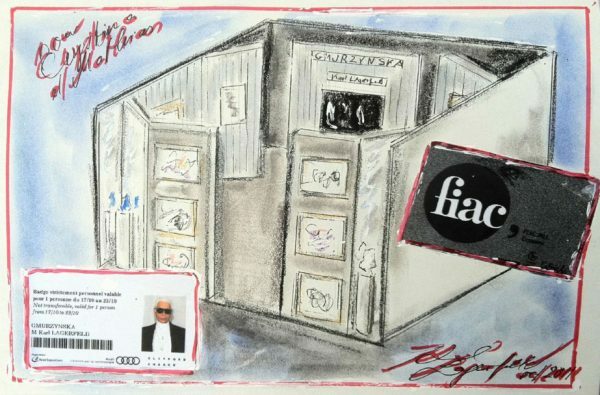 For the 2018 edition, Gigi invited one of New York’s ultimate ingenious artists, DONALD BAECHLER, a prominent figure in the Neo-Expressionist and Pop Art movements during the 1980s. 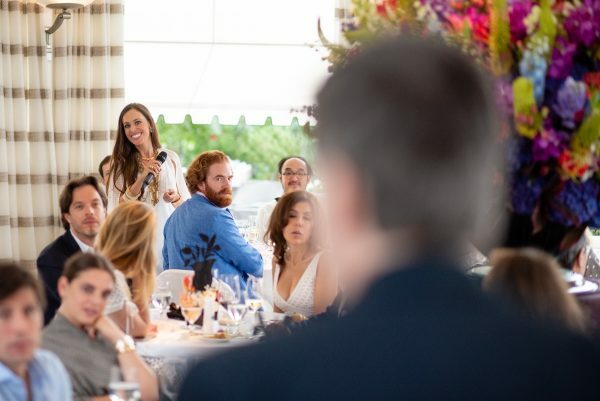 He had especially flown in for the occasion to share with us a unique glimpse into the stages of his practice. 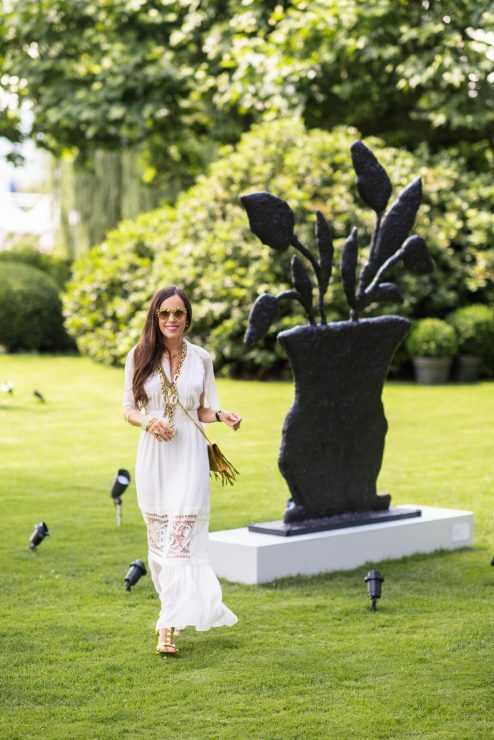 My look: Holzer lace-paneled fil coupé silk-voile maxi dress by Temperley London, leather T-strap sandals with pearls by Gucci, Monogram fringed shoulder bag by Saint Laurent, sunglasses from the Cruise 2018 «The Modernity of Antiquity» collection and bangles, both by Chanel, gold-plated multi-strand necklace by Etro, long necklace in white and gold by Roberto Cavalli, and Mitza ring by Dior Haute Joaillerie. With the lovely hostess, Gigi Kracht, who made this exhibition happen all by herself! 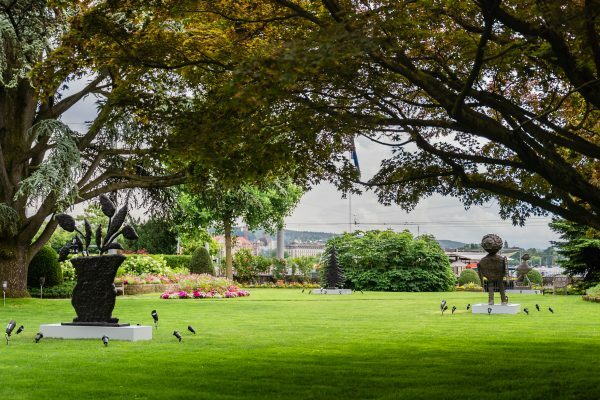 Eight sculptures of Donald Baechler will be on display in the Park until August 3, 2018. 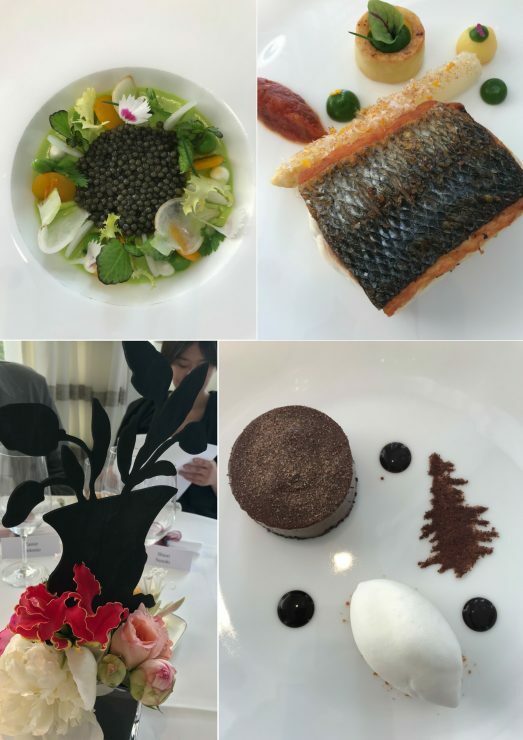 Even the lunch was inspired by the work of the American artist and we could spot the different sculptures on our plates or the table decorations. Loved it! During lunch we were able to ask Donald Baechler questions. 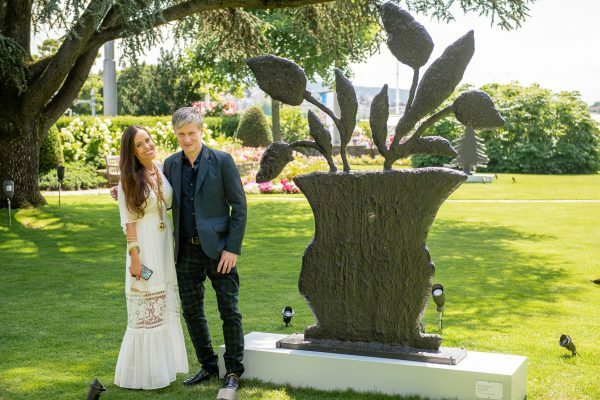 Donald Baechler with me in the garden of the Baur au Lac. «I’m interested in discreet and very mute objects, and I’ve never really been interested in narrative or psychology or these things which many people read into my paintings and probably into the sculptures,» Baechler remarked recently about his work. 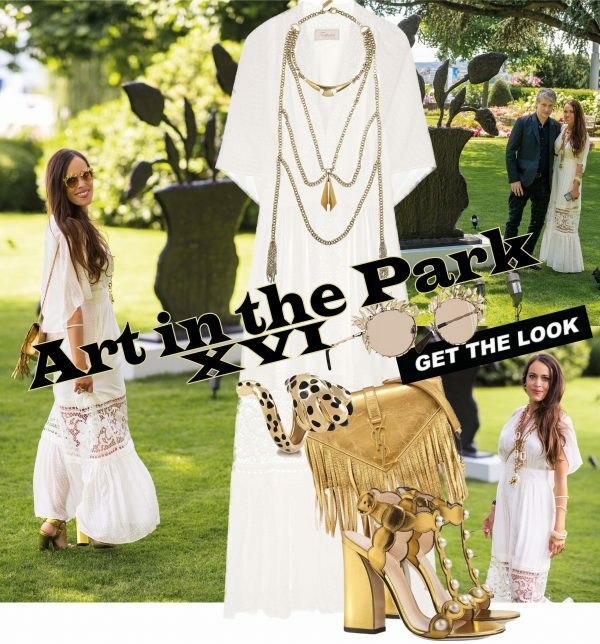 Colour me impressed – don’t miss the exhibition! All Photos: © André Hengst – www.on-eyes-photography.ch – THANK YOU! Last weekend, I was in Paris to celebrate my daughter’s birthday with her girlfriends. 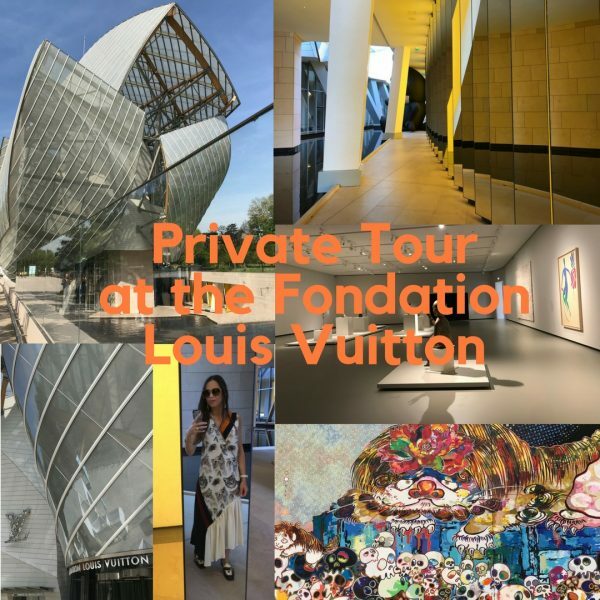 On Saturday morning, we were very lucky as LOUIS VUITTON opened their Foundation Louis Vuitton exclusively for us so that we had a private tour all alone in the museum (a huge thank you!). I have to say this was one of the best experiences ever as the exhibitions are in general very well visited and crowded. 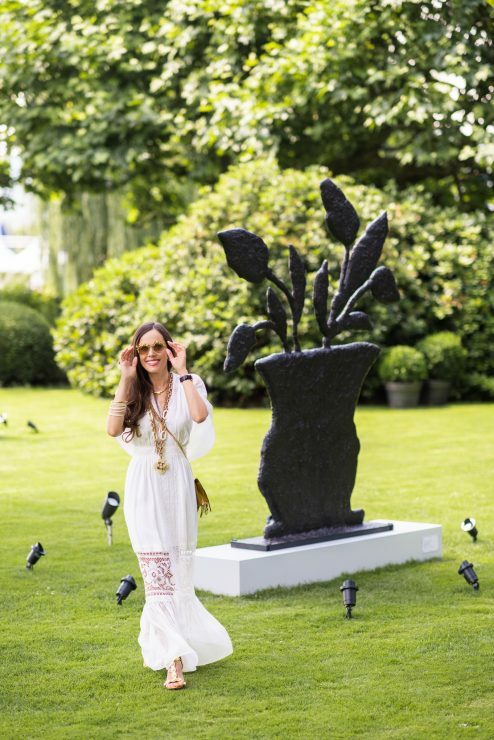 Forget «A Night at the Museum», a day is much better …. 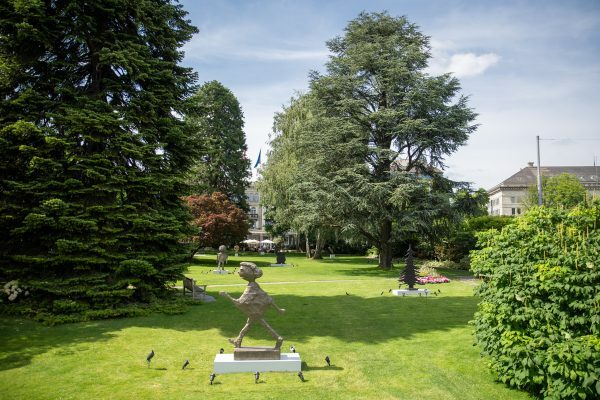 We explored the Foundation’s new selection from its collection in an exhibition entitled In Tune with the World (AU DIAPASON DU MONDE) that will be open until August 27, 2018. This hanging of modern and contemporary works is presented in all the galleries throughout the stunning building designed by Frank Gehry. 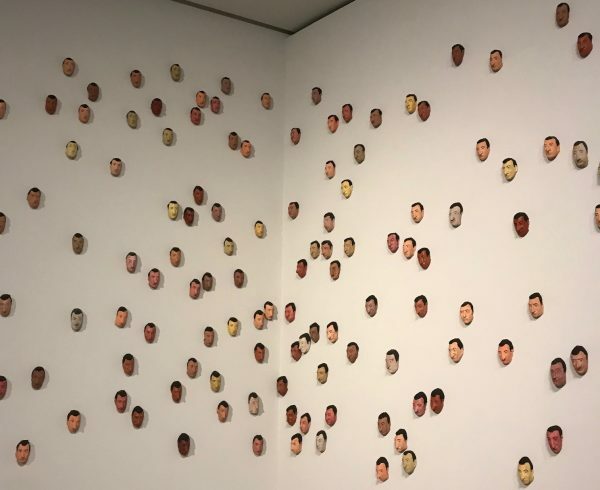 A sense of irony: Maurizio Cattelan – «Spermini» 1997, 150 latex masks that are self-portraits of the artist. It invites visitors to reflect upon the place of humankind in the universe and the relationship between people and their environment and the living world. 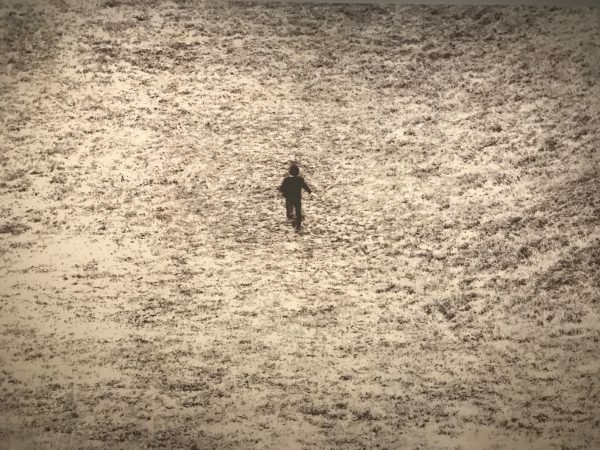 his reflects today’s questions about man’s place in the universe and the bonds that tie him to his surrounding environment and living world, highlighting the interconnections between humans, animals, plants, and even inanimate objects. 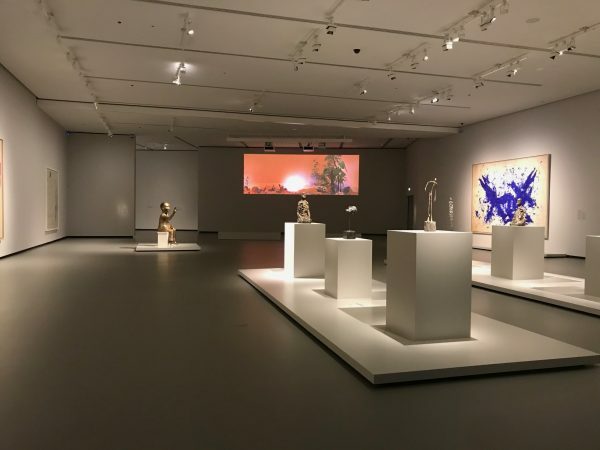 The exhibition features nearly 30 artists – including Alberto Giacometti, Henri Matisse, Gerhard Richter, Pierre Huyghe, Yves Klein and Takashi Murakami – in a hanging that brings together modern and contemporary works. 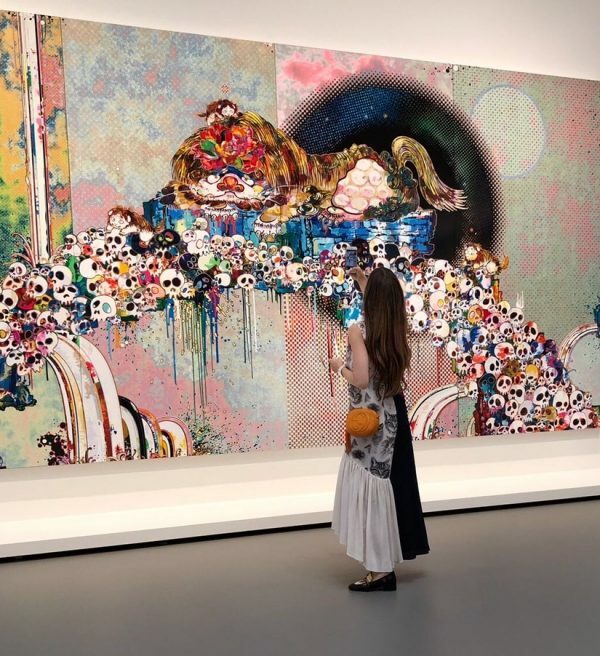 Part A on Level 2 of the building (Galleries 9, 10 and 11) is entirely devoted to the world and works of one of my favorite artists in the world, Japanese born Takashi Murakami. Conceived in collaboration with him, this hanging is organized in three sequences: one centered on the artist’s alter ego DOB; a second is a monumental fresco, The Octopus Eats its Own Leg, displayed for the first time in public; and a third sequence featuring the Kawaii (which means “cute” in Japanese) aesthetic, comprising works in myriad different media. Part B is called Man in the Living Universe, featuring 28 French and international artists from different generations and works in a variety of media and techniques. This part stretches throughout the other three levels of the building, as well as the exterior, in the Grotto. Part B also comprises three sequences: Irradiances (Level 1), Here, Infinitely…” (Level 0) and The Man Who Capsizes (Level -1). 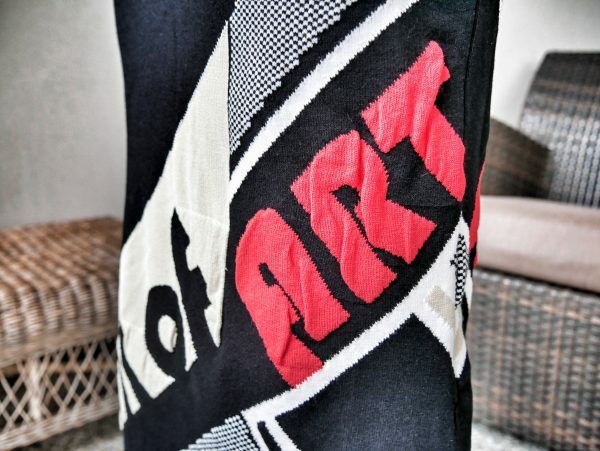 Art changes people’s awareness of their relationship to the world. 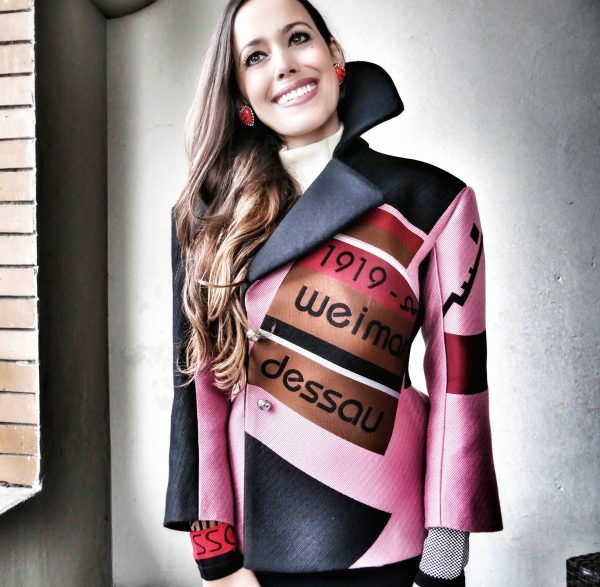 Let me tell you a little more about one of my favourite artists who collaborated with Louis Vuitton for over 13 years (2002-2015). 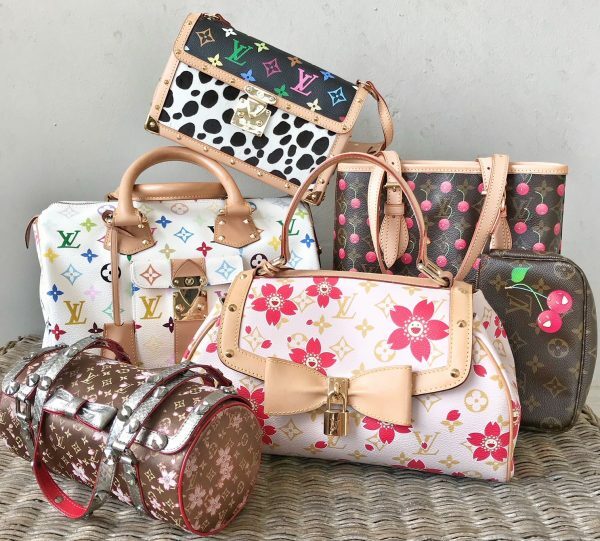 Some pieces from my own personal Louis Vuitton x Murakami collection. 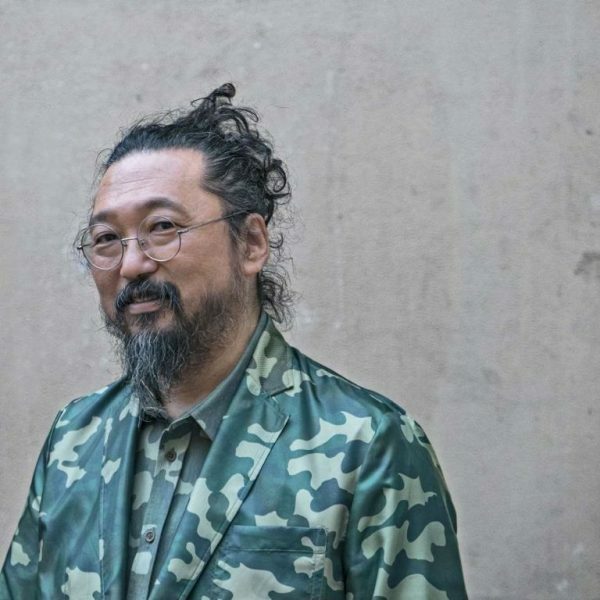 Since the early 1990s, Takashi Murakami has been crafting a unique world of darkness and wonder, one populated by fantastic characters, marvellous animals, fabulous creatures and mischievous monsters.Blessed with an unbridled imagination and a resolutely innovative language combining ancient techniques and advanced technologies, his important body of work is marked by its multiplicity of forms and media – painting, sculpture, installations and even animated film. 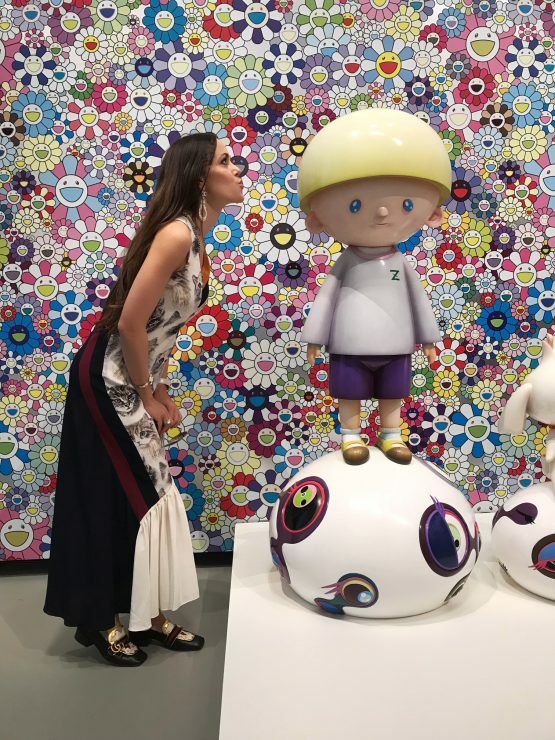 A little kiss for Murakami’s artwork «Max & Shimon». 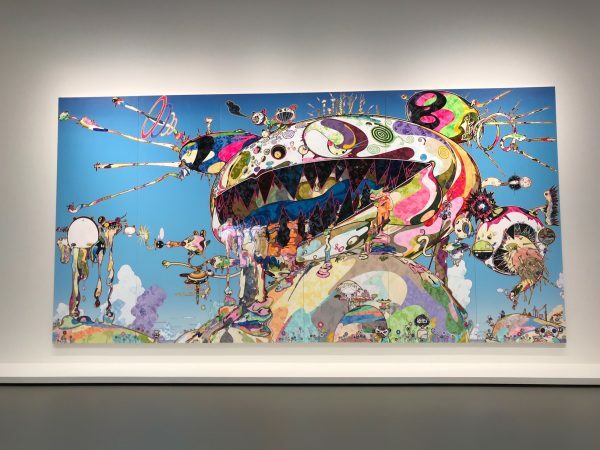 Drawing on Japan’s political, social and cultural history, his colour-saturated universe borrows as often from Kawaii aesthetics and manga pop as from the ancient masters of classical painting and Buddhist iconography. 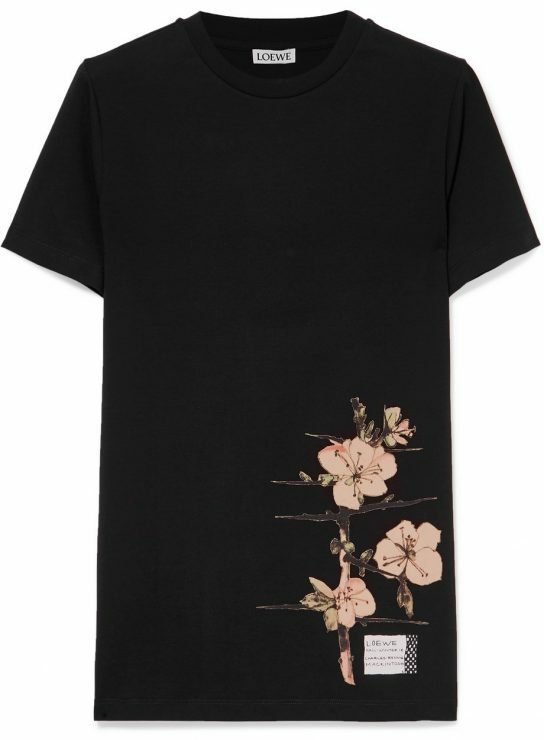 Also omnipresent are references to recent traumatic events, such as the atomic bomb and the tsunami. 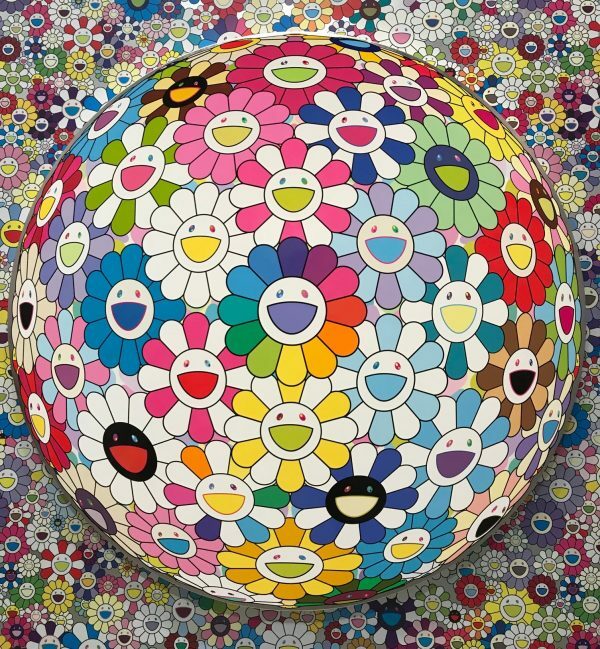 Takashi Murakami Flower Ball – one of my favorite art works. The exhibition In Tune with the World is accompanied by a series of conversations with artists and experts. 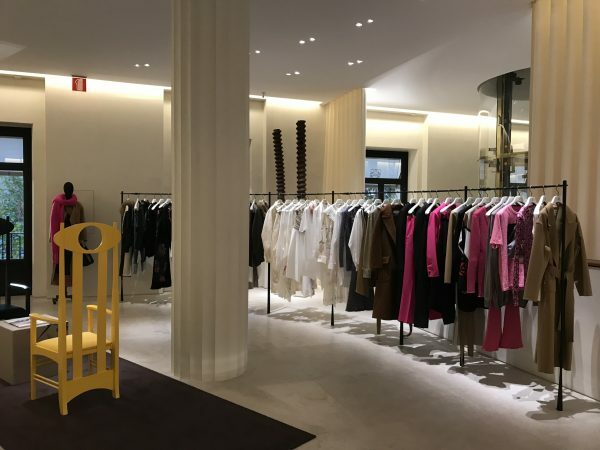 8, avenue du Mahatma Gandhi, Bois de Boulogne, 75116 Paris. Reservations: on the website www.fondationlouisvuitton.fr. 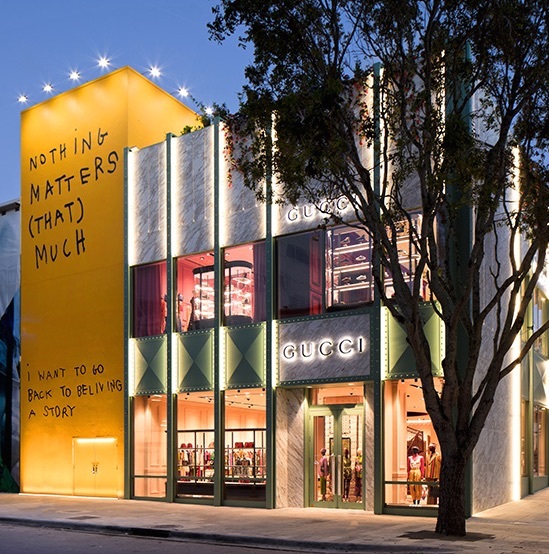 GUCCI has opened its new stunning two-floor boutique with over 4,700 square feet showcasing the latest women’s and men’s collections as well as Gucci Décor in Miami’s Design District. 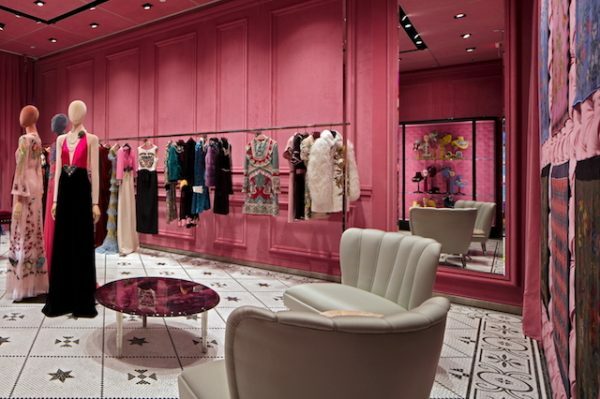 Creative Director Alessandro Michele has had a hand in the design concept which includes immersive concept elements such as velvet armchairs, industrial accents and other luxurious details.